The last 3 mornings Beauty and Archer have basically gone through the same motions. Joining each other in the nestbox for some conversation and bowing. Beauty staying close to the nestbox and Times Square building. Archer flying out of the Times Square area for hunting purposes and returning with prey to share with or present to Beauty as proof that he is a good provider. 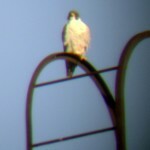 Any day started with Peregrine Falcons is a good day! I am fortunate to start almost everyday with our Rochester falcons and I’m more than happy to share with all. Todays morning watch was pretty much the same as it has been since Archer returned from migration. Beauty and Archer hanging out on the Wilder building,Times Square,OCSR and of course Mercury. 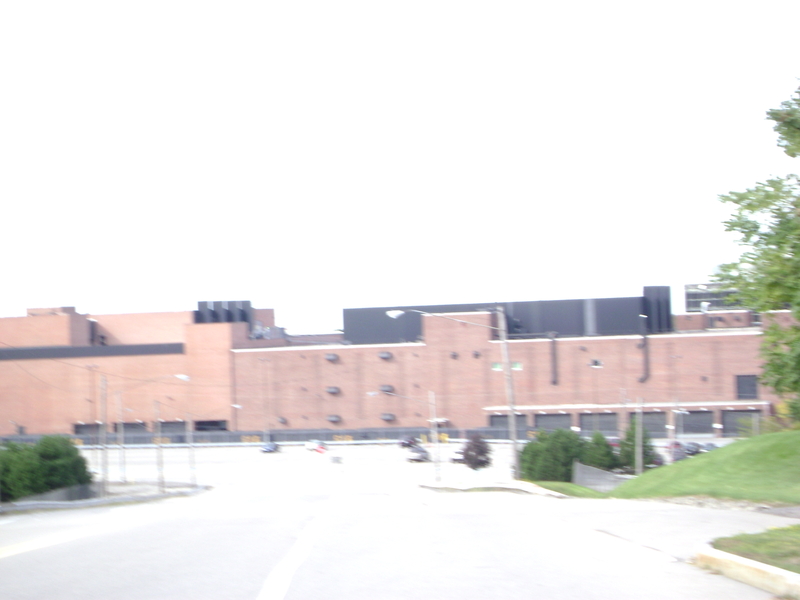 Throw in a visit to the jail tower and Kodak Office building today and you have a full watch! I went home to have a cup of coffee and take a break and wait for Joyce to come pick me up for a watch together. 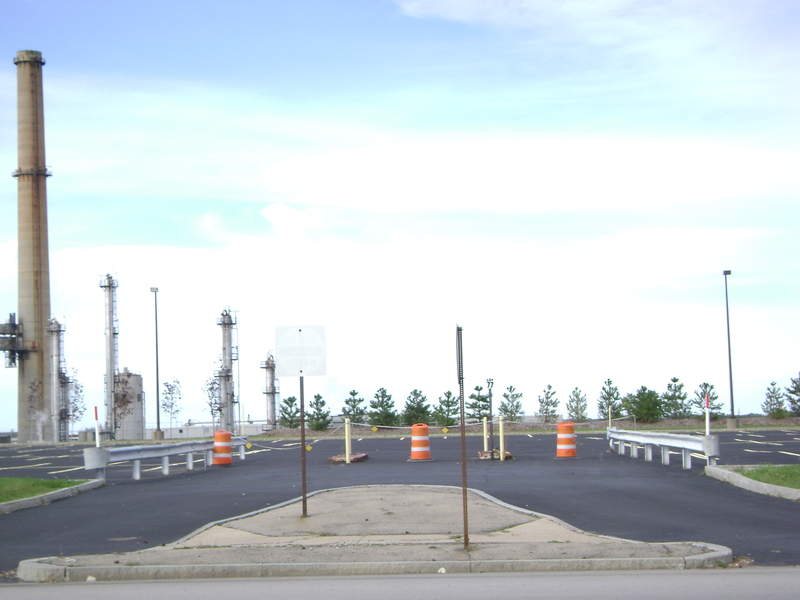 First we went to Kodak Park where we found Lady Pefa on the railing of the ORB(orange railing building). 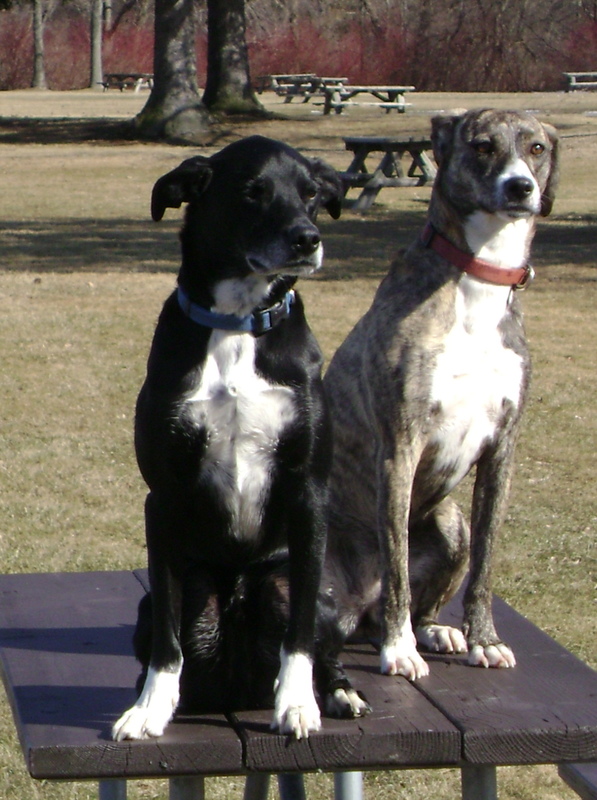 We took a ride out to Hamlin(I had to pay our taxman who lives out there) and stopped at the Hamlin Beach State Park to let the dogs run. On the way back we checked out Braddocks Bay and Charlotte. Too cold for migrating raptors but we did see many Turkey Vultures. We ended up at the Irondequoit Bay where we found one Bald Eagle flying near it’s nest being harrassed by what Joyce thought may have been a gull. Perhaps the eagle stole a fish from it. I don’t know why else it would be bothering a BIG eagle! Joyce and I ended our “fun as usual” watch downtown with Beauty and Archer. We witnessed them sharing a meal and flying the friendly skies of Rochester! 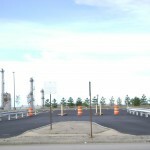 Here’s a link for more pics of the day. Enjoy! Rochester Falcon Watcher Carol P.
Although the calendar says it’s Spring here in Rochester, NY, the frigid cold temperatures say differently. It was very cold, but the sun was shining and the sky was blue. I met quite a few of my fellow Watchers out and about this weekend. Took lots of pictures (which I still have to find time to go through) and a few videos. Here’s one video that I really wanted to share with everyone. I took this one today. It shows Beauty on the corner of the Wilder Bldg, which is across the street from the Times Square bldg, where the nest box is located. Archer was sitting on the Times Square Bldg. He took off and well, you can see the rest for yourself. Hello everyone! If you follow my tweets on the forum you’ll know what an active morning watch I had. Beauty and Archer are staying within view of the nestbox and each other. Flying from Times Square to the Wilder building to the OCSR building. I would guess this means an egg will be coming soon. Here’s the link to pics from this mornings watch. 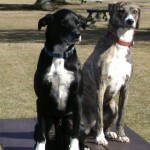 I also took several short videos of Stella and Stash. For those of you that have never seen Peregrine falcons live, I hope these give you a little feel for what it’s like. Pay real close attention and watch for them turning on the speed in their flights. It was very windy so the sound of it is loud. You can hear eechupping though. Enjoy! Buffalo watch 3 25 11 Tag you’re it! Buffalo watch 3 25 11 Just watch them! Hi everyone! Monday mornings watch was abysmal!!! I could see very little with the rain and darkness and reflections off the street lights, but did manage to catch a quick glimpse of one of our fabulous falcons fly up from below to the nestbox. Donna reported to me that both Beauty and Archer were in the nestbox. And so I sat there in the truck for the rest of my watch wondering if they were still in there cuz I could not see! Some days it’s like that! Yesterday morning turned out much better! 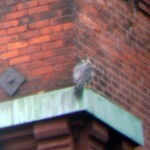 I first spotted Beauty in the nestbox and Archer under the southeast wing of the Times Square building. He flew off behind buildings and returned under the wing with a fresh kill. He began to prepare it for his mate as feathers started to fill the air around him. Archer then flew down to the nestbox and delivered the goods to Beauty who was waiting for him. DebbieH stopped by to see our Rochester falcons. Both Beauty and Archer ended up over on the green strip of the Wilder building making eyes at each other. They are so cute sometimes. They both flew off with Archer going to the Old Changing Scenes Restaurant and Beauty going to parts unknown. I went home at that point thus ending my morning watch. Joyce picked me up late afternoon for a watch. We found Beauty on the southwest corner of the Wilder building and Archer was at the base of Mercury. I told Joyce to get ready cuz I thought they might copulate and sure enough Archer flew over landing on Beauty for what Joyce called “the quickest happy connection she had ever witnessed”! 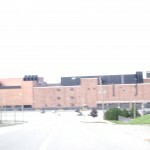 We decided to go to Kodak Park and pick up Brian before heading out. 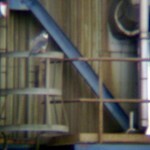 Upon arrival we spotted a falcon on the west stack lower catwalk. 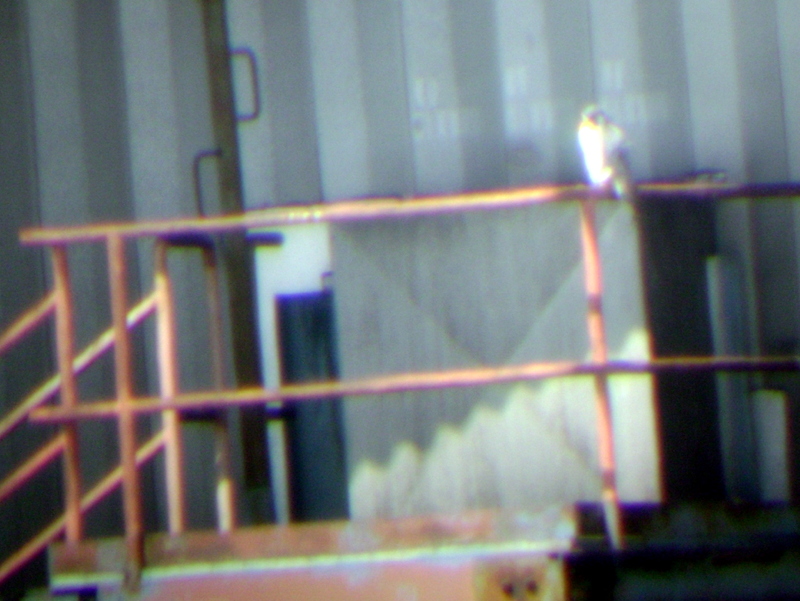 Shortly after, a falcon flew in and landed on a railing just to the left of the east stack. 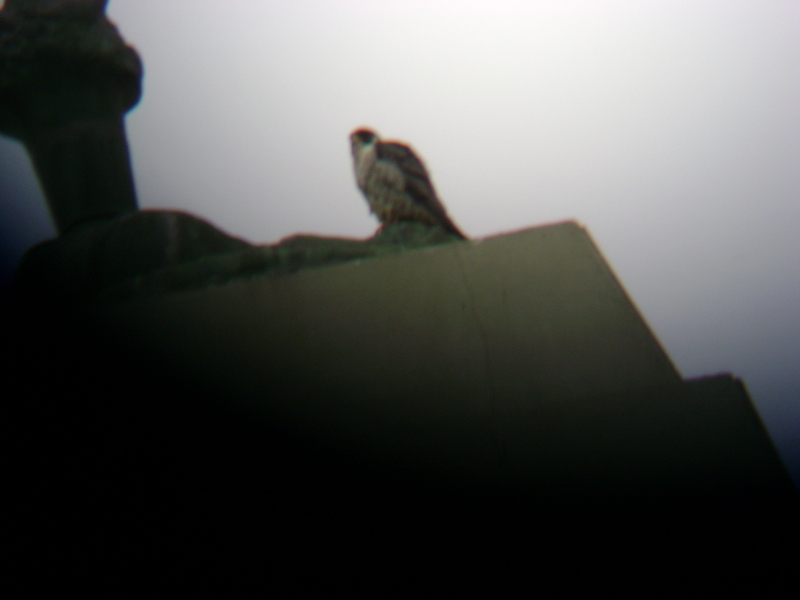 CarolP arrived in time to see both falcons fly to the south and out of sight. 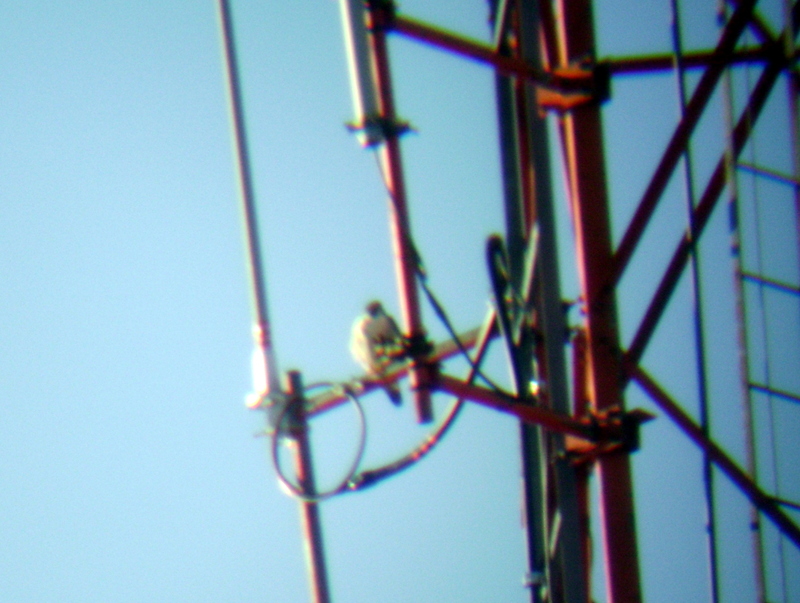 Brian felt like this might be the big tiercel that was with Lady Pefa for awhile last fall. Joyce and I agreed this male was almost as big as her. Dana showed up just before we left to end our watch. This morning I forgot my camera so there are no pics from that watch. It was clear and crisp when I arrived downtown. 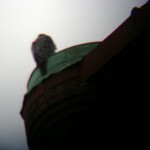 I saw a falcon fly up from below the nestbox as I have witnessed several times inthe last few days. It was too dark to see anything in it but I got a text message from Donna that it was Archer and then a few minutes later both Beauty and Archer in the nestbox. I never saw them leave but I did spot them on the top ibeam of the OCSR building. Archer on the south corner and Beauty on the west corner. It started snowing as Beauty flew to the east over the river and out of sight and of course while I watched her Archer slipped off OCSR. I spotted one of them on the northeast corner of Bausch and Lomb and it appeared to be eating. Couldn’t have been much cuz it wasn’t there long. I missed it leave from there. My last sighting before I left was Beauty at the nestbox and then flying off. Please pardon the bad pics(I’m trying). Have a great day! 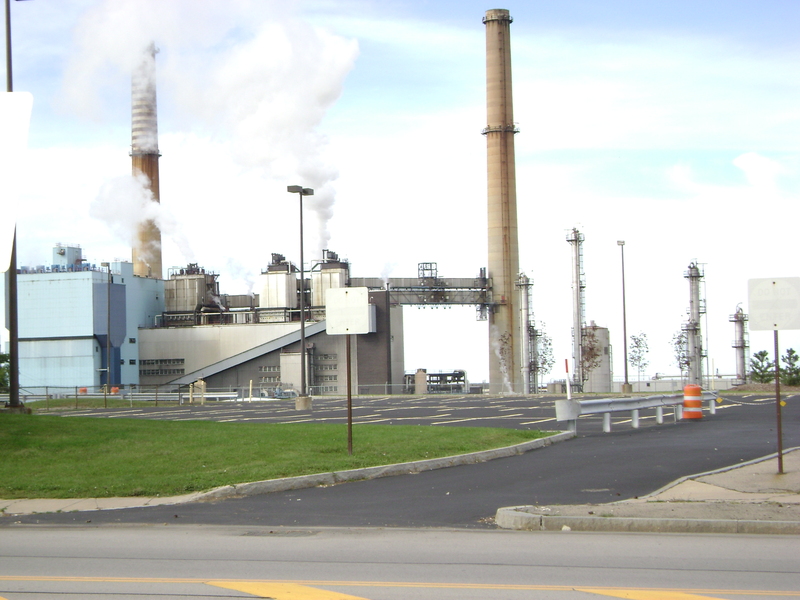 While crossing the Irondequoit Bay bridge on our way downtown we had a falcon(we assumed it was Charbay) fly up from under the bridge on the north side of the bridge right in front of us in the dark across all 6 lanes and then flying down under the bridge on the south side. Whew, talk about good timing! We ended our day on the Broad St. bridge by saying goodnight to Beauty who we found on the money bag hand of Mercury. No sighting of Archer. I just love the new world Rochesters falcons have given me! Good night! 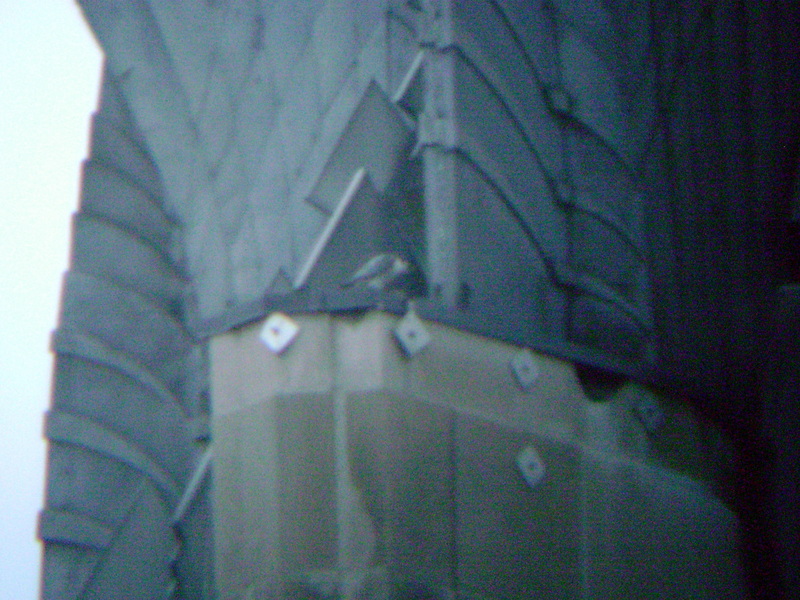 Rochester Falcon Watcher - Carol P.
Today the Rochester Falcon Watchers were keeping an eye on two locations; downtown Rochester where Archer and Beauty (A&B) have a nest site on the Times Square bldg and a female, temporarily named Lady Pefa (LP) and a Tiercel seen with her the last few days. 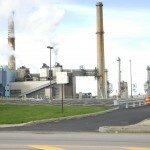 I arrived at Kodak Park (KP) just before 9:30 am. MAK & Dana were downtown keeping an eye on A&B, who they reported had copulated and were flying all over the place. Soon after I parked my car and called in that I was there, I spotted a Falcon flying from the still and landing on the orange railing building (ORB), below the chute. This location is new to the Watchers and we haven’t come up with names for all the structures and buildings yet. 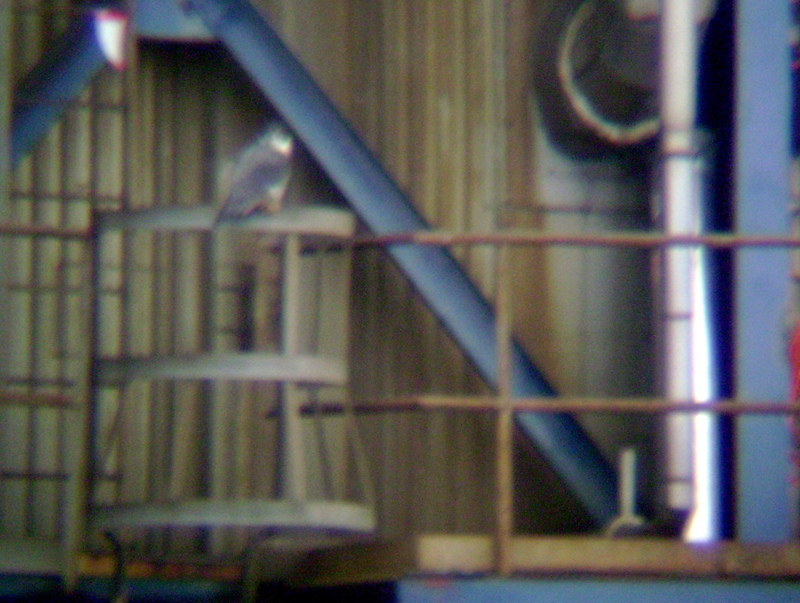 About 5 mins later, a Tiercel (male) flew in and landed on the tallest still. 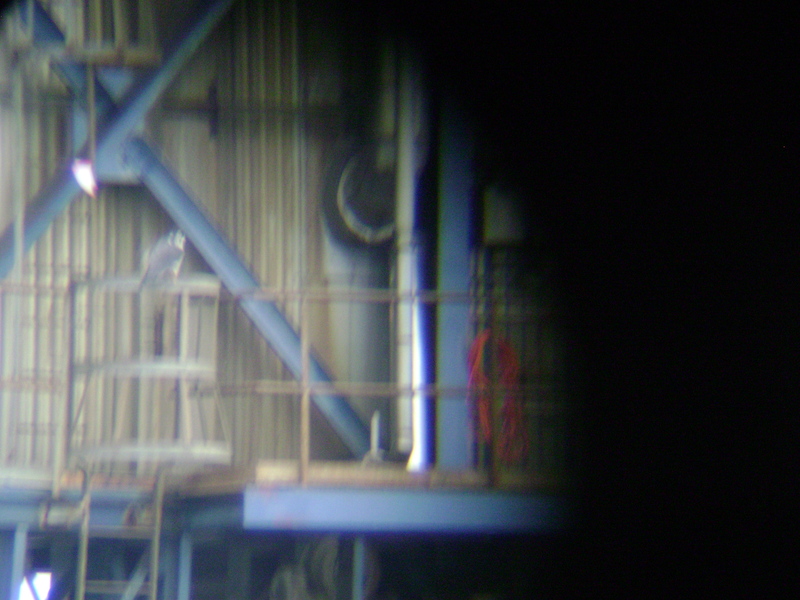 I quickly got the scope out to get a closer look at the male. Were my eyes deceiving me? 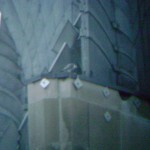 Was that a white feather on the Tiercel’s right wing? I called Dana to see if they still had Archer and Beauty downtown. She and MAK were on their way to KP. MAK had reported that only Beauty was in sight before they left. OK. I needed a 2nd and 3rd opinion on this one. 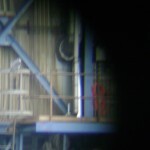 MAK and Dana joined me and I asked them to take a look through the scope. They both agreed. 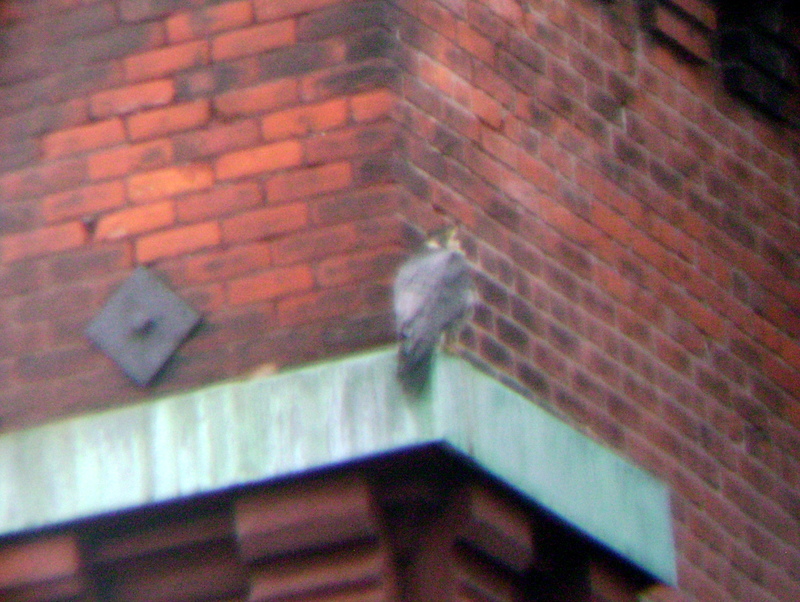 It looked like a white feather on the right wing of the Tiercel. For those that closely watch the cameras at the Time Square Bldg, you’ll know that Archer has a white feather on his right wing. Could this be Archer? Was he hanging out with both Beauty and Lady Pefa? We have our suspicions that he might be traveling between both locations, but we can’t be 100% sure. Hopefully, over the next few days, we’ll get a better idea if this was in fact Archer or not. We certainly hope it’s not Archer, but this is not unheard of. 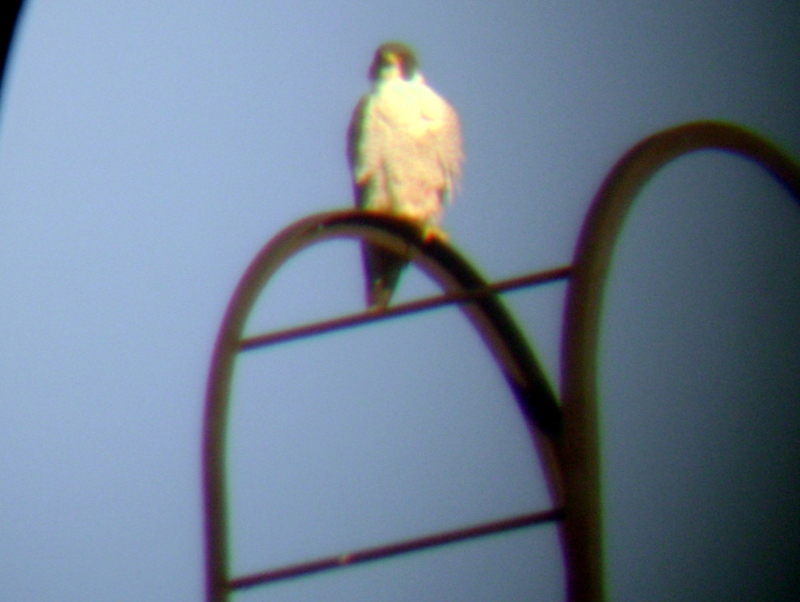 There are documented cases of one Tiercel with two different female Falcons. 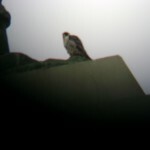 All day, the Rochester Falcon Watchers (MAK, Dana, Dan, Brian H and Carol P) split up between downtown and KP. We’ll continue to keep a close eye on both locations and report what we see. Never fear, we will keep Watching! My morning watch started with Beauty at the nestbox and Archer under the southeast wing of the Times Square building at around 7:00am. 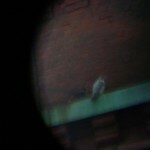 My watch ended at 4:45pm leaving our downtown Peregrine Falcon pair Beauty and Archer in their nestbox. Needless to say I’m tired and so I will sum up the whole day by saying I think this is the greatest show on earth! Being my first spring and courting season in the field I am seeing so much action I can barely keep up! Other watchers I shared my watch with include:Dana.LarryO and Cleo, CarolP,Brian and last but not least Dan. I was very happy to drive onto the Broad St. bridge and see my morning watch partner Dan in his lawn chair on the sidewalk. That great smile of his beaming, this would be our first watch together since last fall. It felt good! I split my watch between downtown and Kodak Park as we were trying to get an ID on the male that had been spotted there with Lady Pefa. 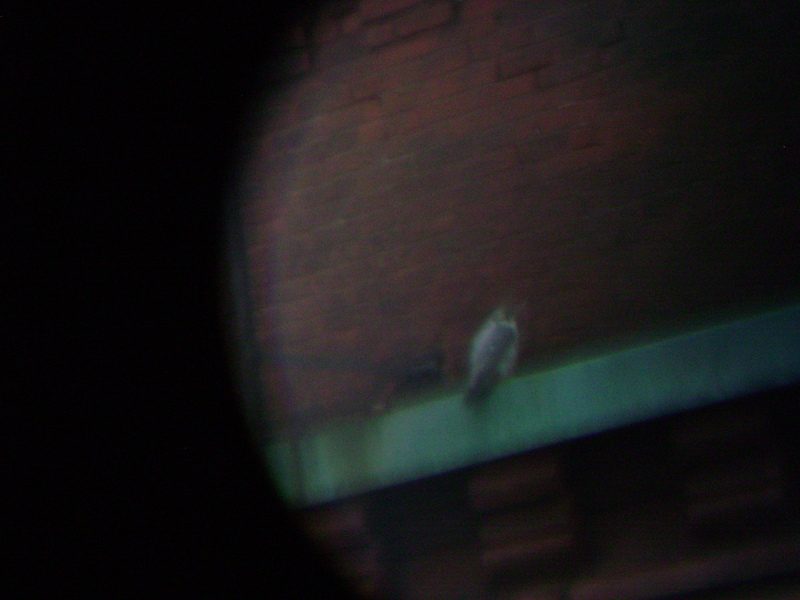 We believe we saw a white feather on the right wing of this tiercel looking through Carols scope. Was he Archer, we are not clear on this. When I joined Dan at about noon he said that Archer flew in at 10:45 landing under the southeast wing of the Times Square building and didn’t go out of his view after that at any time.Carol tweeted at 11:25 that both pefas flew off 15 minutes ago. In my opinion this proves that Archer was downtown when we thought we had him at Kodak Park. Hopefully one of us will get a look to see if the male at Kodak Park has leg bands. I saw plenty of flying,gliding, soaring and stooping today at both locations. I saw Beauty and Archer get together for a brief love moment. I saw Archer striking and chasing a Red-tailed Hawk out of downtown. I saw hovering Kestrels at Kodak Park. I saw pefas chasing those very kestrels. I saw crows being chased by falcons at Kodak and downtown. My favorite sighting of the day would have to be when Beauty flew off Times Square almost straight down and flew down Exchange St. southbound between the Blue Cross Arena and the Democrat and Chronicle building. She was maybe 30-50 ft. above street level and OMG I loved it! I will end my report with the link for pictures of the day. Enjoy! KathyO picked me up this afternoon for a watch. We began downtown on the Broad St. bridge. 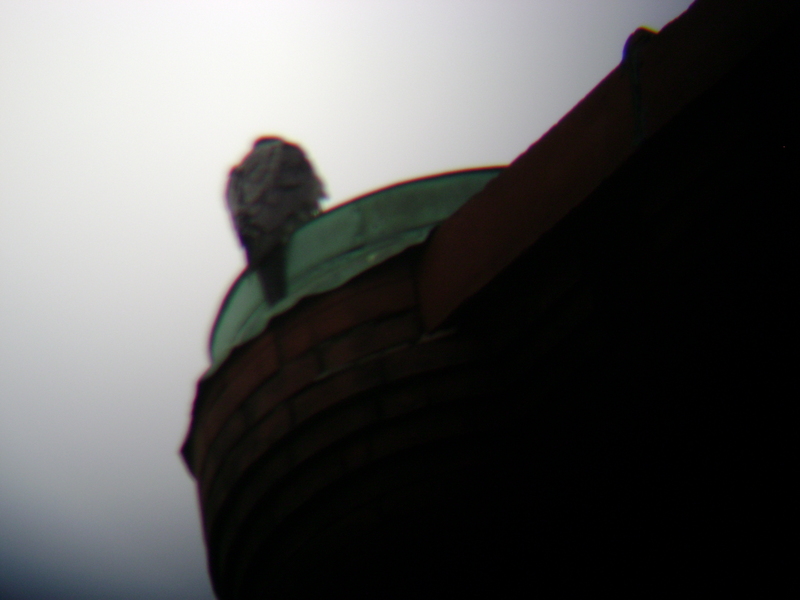 We could see one falcon in the nestbox and after going down to falcon central we could see Archer on the green strip of the Wilder building and so it was Beauty in the nestbox. 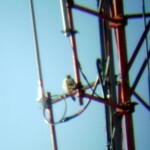 Kathy had to run an errand and when we got back we found Beauty on the Frontier Communications Tower. No sign of Archer so we went to Kodak Park. CarolP came and shortly after LarryO with Cleo joined us on the watch. 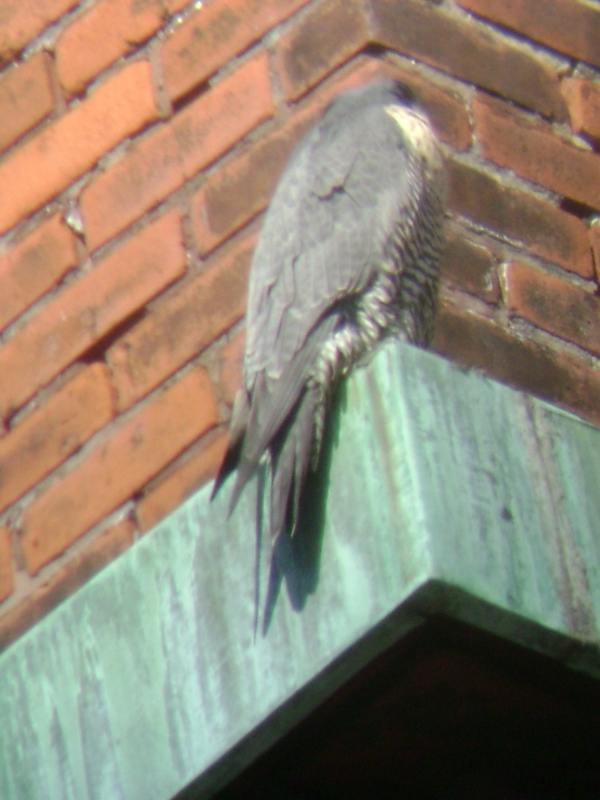 The male came in, there was some low flying in front of the complex with both of them landing on the building with the orange railing. They left and flew south/southeast until we couldn’t see them anymore. Larry left and as Carol,Kathy and I were about to leave Louigi and Dana showed up. I gave him a birthday hug and when Kathy and I left Carol was giving them a report of the events. It was a good day for falcon watching!